SAN DIEGO, May 11, 2017 /PRNewswire/ -- Bridgepoint Education, Inc. (NYSE: BPI) announced Ashford University has won the Innovation Award for the development of Constellation, a state-of-the-art platform and suite of e-online textbooks that support learning through the use of dynamic, interactive material. Developed by employees at Bridgepoint and its academic institutions, Ashford and University of the Rockies, Constellation replaces the need for traditional textbooks created by outside publishers and instead hosts original, peer-reviewed textbooks online. 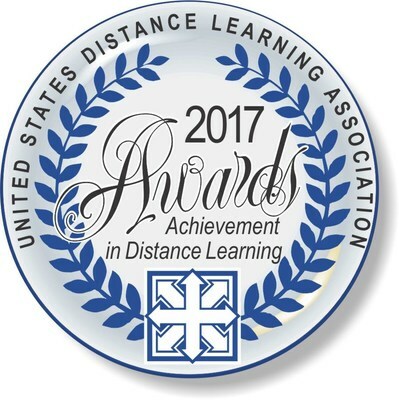 The Innovation Award is a prestigious award given by the United States Distance Learning Association (USDLA), which recognizes unique approaches to the delivery of distance learning. Submissions for the Innovation Award were scored based on their originality, significance, measurable impact, and more. There are five categories recognized each year: K–12, higher education, corporate training, telehealth, and military/government. "Constellation is an outstanding example of our dedication to providing tools and resources that can help students succeed," said Andrew Clark, president and CEO of Bridgepoint Education. "We are proud to be recognized as innovators in producing new technology in education; we believe it is important to push forward, think outside the box, and create new, meaningful solutions for our students." Bridgepoint employees accepted the award in person at the USDLA International Awards Ceremony in Indianapolis, Ind. on Monday, May 1. For more information about Constellation visit https://www.ashford.edu/blog/technology/online-learning-tools-five-questions-about-constellation. The United States Distance Learning Association (USDLA) is a 501(c) 3 non-profit association formed in 1987 and is located in Boston, Massachusetts. The associationreaches 20,000 people globally with sponsors and members operating in and influencing 46% of the $913 billion dollar U.S. education and training market. USDLA promotes the development and application of distance learning for education and training and serves the needs of the distance learning community by providing advocacy, information, networking and opportunity. Distance learning and training constituencies served include pre-k-12 education, higher and continuing education, home schooling as well as business, corporate, military, government and telehealth markets. The USDLA trademarked logo is the recognized worldwide symbol of dedicated professionals committed to the distance learning industry. http://www.usdla.org or call Marianne Perez, Media Relations Manager, at 858.668.2586 x11636, or email marianne.perez@ashford.edu.